Order in next 4 hours and 26 minutes for despatch today. 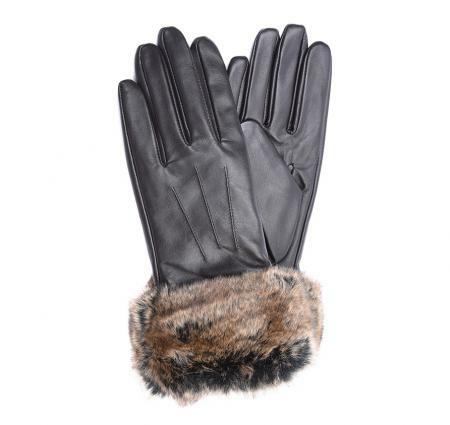 These elegant women's gloves by Barbour, are crafted in beautifully soft leather and feature a faux-fur trim to the cuff. 100% real leather outer. 100% polyester inner. Faux-fur trim. Ladies glove sizes small (6 to 6 1/2), medium (6 1/2 to 7) and large (7 1/2 to 8).SALE! Please round UP from your measurement to find your glove size. We offer free exchanges on all sales, but would like to sell you the correct size glove first time around, so please follow the instructions below carefully. 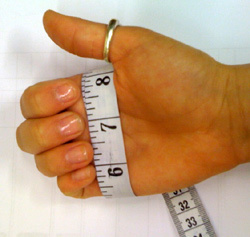 Take a tape measure which measures in inches and wrap it around your strongest hand, just below the knuckles (as shown in the first photo). 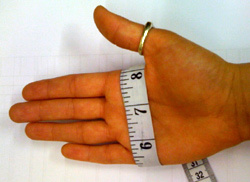 Then make a loose fist (as shown in the second photo) the measurement shown on the tape is your glove size.